The 33-year-old Ronaldo has been involved in 44 percent of Juve’s goals this season, having scored 10 and assisted six others. And Mandzukic is clearly reaping the benefits. The Croatia international scored five goals in 32 league matches last season and already has six in 10 this campaign after developing an impressive understanding with Ronaldo. “Mandzukic is scoring because maybe with Dybala he played in one way, where Dybala was benefiting from his movements, and now he’s benefiting from the way Ronaldo plays,” Juventus coach Massimiliano Allegri said. Fellaini touched the ball with his hand just before scoring and Valencia coach Marcelino said the implementation of the video review system in the Champions League can’t come fast enough. VAR is already in place in Italy and Spain and will be used in the Champions League from next season but its introduction could be brought forward to this campaign’s knockout stages. UEFA’s executive committee could make a fresh decision at a Dec. 2-3 meeting in Dublin. Juventus has a two-point advantage over United and will secure top spot in Group H with a win over Young Boys on Dec. 12. If it draws, a United win would see the English team top the group thanks to having scored more away goals in the matches between the two teams. 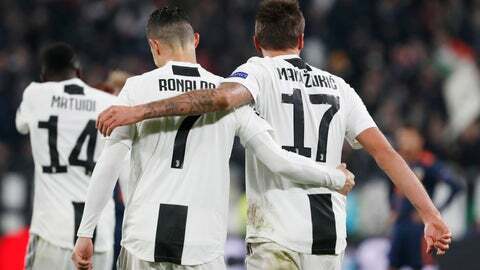 Ronaldo had scored his first Champions League goal for Juventus in that game and looked eager for more against Valencia, having been sent off against the Spanish team when the two sides met in September — in a match Juventus went on to win 2-0 despite its numerical disadvantage.